Any serious sailor, diver, or adventurer wouldn’t go near water without one of these. Fortis Marinemaster timepieces have been a favorite of sailors, divers and naval officers ever since they were initially introduced in the early 1960’s. These professionals were quick to recognize that the Marinemaster was a serious timing tool that they could depend on in any situation. 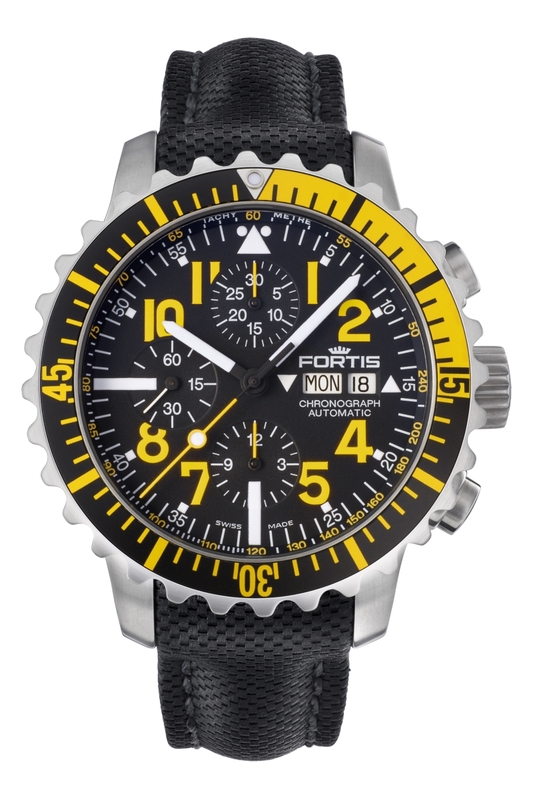 Over the years, Fortis has continued to refine and enhance the Marinemaster design and many feel that the current collection of these superb sea-going timepieces is the best they have ever produced. 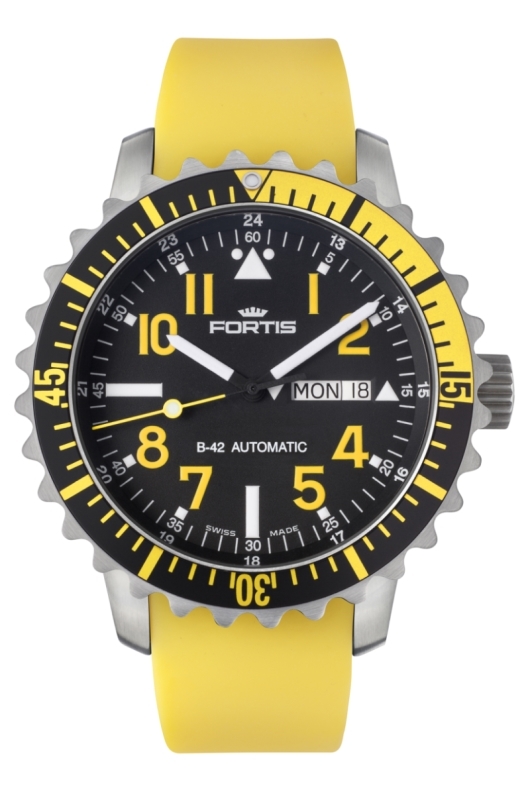 Sharing a common heritage with the legendary Fortis B-42, the impressive 42 mm Marinemaster features an impregnable three-piece stainless steel case that is water resistant to 660 feet. To accommodate divers wearing gloves, the clearly marked unidirectional rotating bezel has extra large stainless steel lunettes instead of the typical knurled edge. 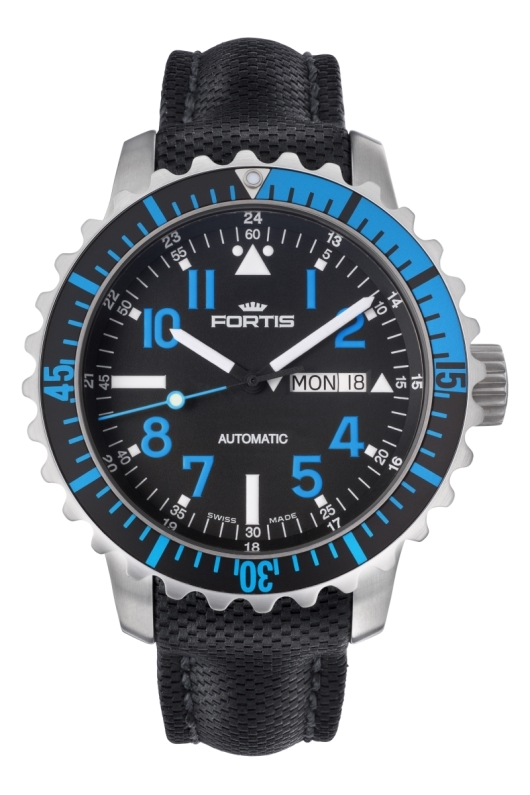 This extra touch greatly enhances use of the bezel under water. The functional dial is clear and easy-to-read even under difficult lighting conditions with bright white Superluminova hands and indices. 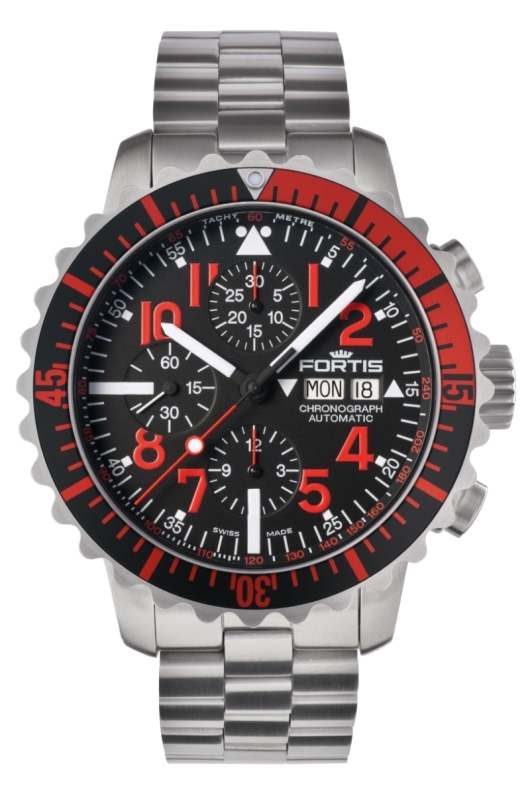 Chronograph versions of the Marinemaster feature a 30-minute totalizer at 12 o’clock, a 12-hour totalizer at 6 o’clock, and a free running small seconds dial and 9 o’clock; making it easy to time virtually any type of event. 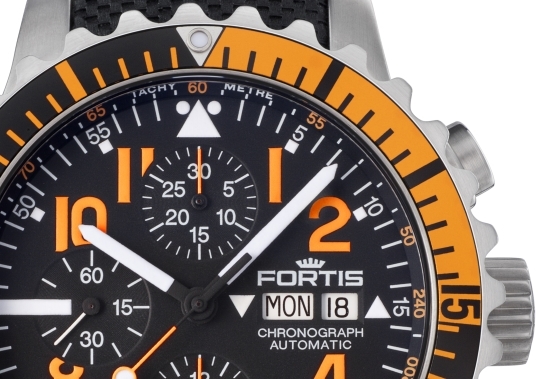 In addition to the rotating 60-minute scale on the bezel of all Marinemaster timepieces, the three-hand configuration includes a handy 24-hour scale inscribed on the chapter ring, while the chronograph versions feature a tachymeter scale in this location. Dual windows for the day and date at 3 o’clock complete the impressive display. 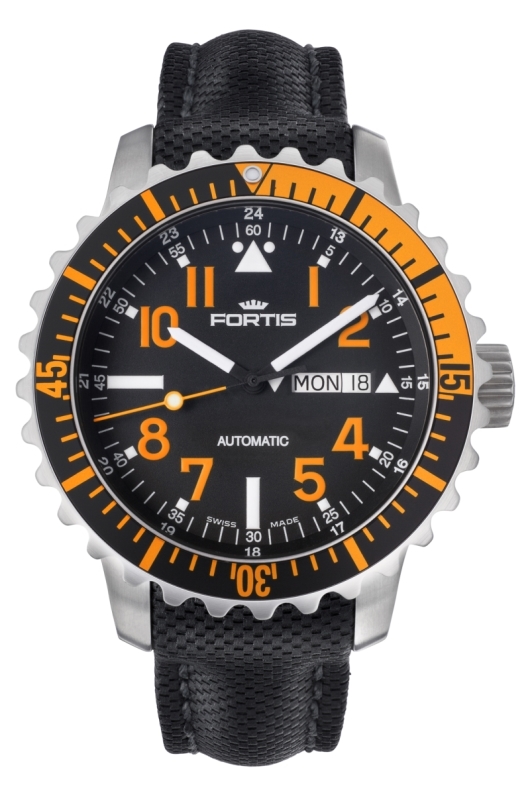 Fortis Marinemasters are powered by a precision Swiss made automatic movement and equipped with a solid screw down stainless steel caseback, engraved with the traditional Fortis submarine, for greater water resistance. 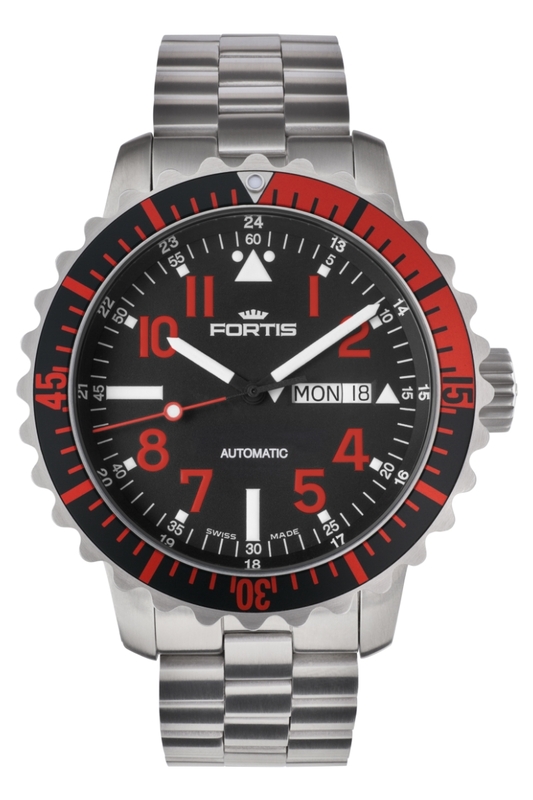 To protect the easy-to-read dial, there is a scratch resistant sapphire crystal that has an advanced anti-reflective coating on both sides. 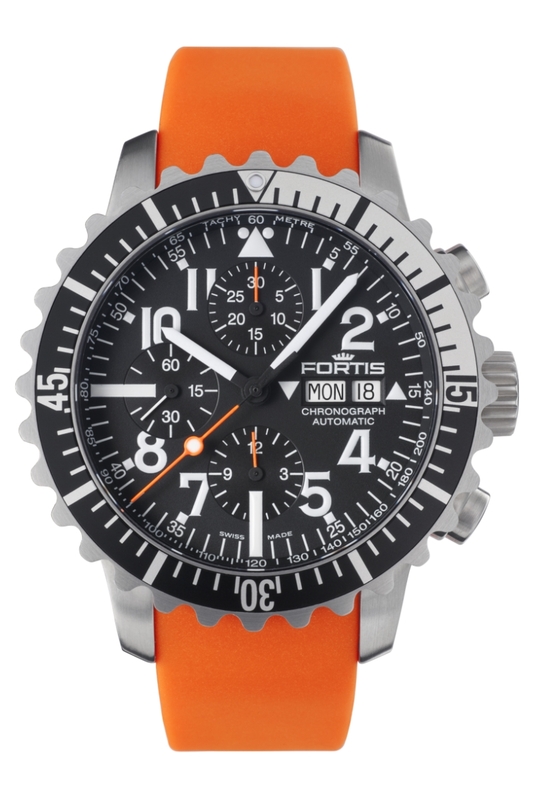 Both the three-hand and chronograph versions of the Marinemaster are available with a choice of blue, white, orange, red, or yellow dials that can be equipped with a premium topstitched leather strap, a colorful silicon strap, or a solid stainless steel bracelet. 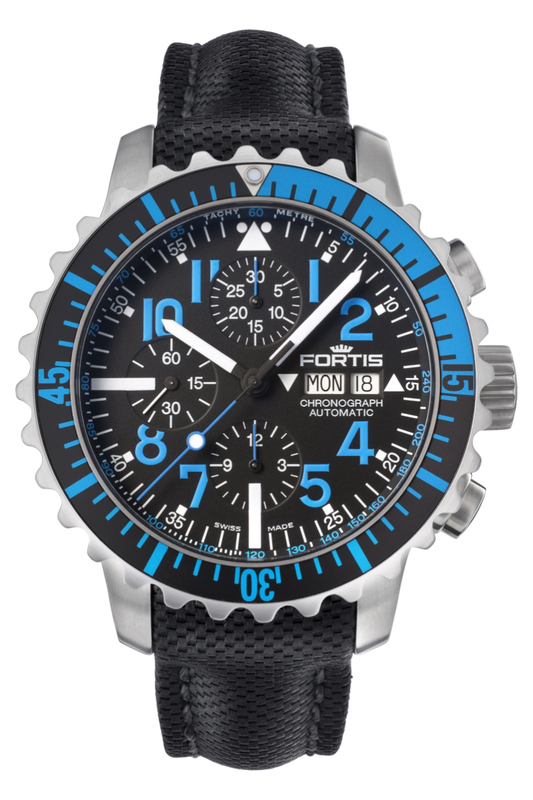 To put one of these professional timing tools on your wrist, contact an authorized Fortis dealer today and ask to see the exciting new Marinemaster Collection.